New gene editing techniques could revolutionize medical care, eradicating gene-linked diseases such as cystic fibrosis and enabling couples to buy intelligence boosts for their embryos. But first, scientists, doctors and faith leaders must debate some serious ethical questions. Genetic counselors and researchers have convened conferences and committees to address key issues, asking whether it’s appropriate to conduct tests on human embryos and what types of treatments would take this medical advancement too far. They’ve circled up with the parents of children affected by genetic disorders and members of the clergy, seeking to determine when efforts to alleviate suffering actually cause more harm. Moral concerns won’t end when scientists and government leaders agree on boundaries to govern gene editing. The treatment method could widen the inequality gap between rich and poor patients and make life even more difficult for people with inherited disabilities. Parents could be pressured to cure a condition such as deafness, which is not life-threatening. Eighty-seven percent of U.S. adults believe it’s “very” or “fairly” likely that gene editing will increase inequality, according to Pew Research Center. Ahead of the second international summit on human genome editing, which will take place in Hong Kong from Nov. 27 to 29, here are surveys, news reports and sources to help you explore the ethical questions created by this scientific advancement. Pre-implantation genetic diagnosis refers to the process by which doctors screen embryos for genetic disorders during an in vitro fertilization cycle. Couples may opt for PGD if they know they’re carriers of a gene-linked disease. Human genome editing would allow scientists to correct genetic problems found through PGD or target and treat gene-linked disorders that appear later in life by adding or removing DNA material. Some bioethicists and researchers believe gene editing is too risky to test on human embryos, which has slowed the development of related technologies. CRISPR-Cas9 is the most advanced editing technology researchers can use to remove the segment of DNA causing a genetic disorder or linked to an undesirable trait. Somatic gene editing refers to gene editing that treats or cures a condition in nonreproductive cells. This process is much less controversial than germline gene editing, which involves changes to the DNA that would be passed on to future generations. Read and watch “Scientists can design ‘better’ babies. Should they?” from The New York Times on June 10, 2018. Read “Genes, synecdoche and the possibility of editing ourselves” from Resilience.org on May 20, 2018. Read “Gifts from God: How religion is coming to terms with modern fertility methods” from The Washington Post on April 27, 2018. Read “The Gene-Editing Conversation” from the January-February 2018 issue of American Scientist. Read “Opinion: Should we use gene editing to produce disease-free babies? A scientist who helped discover CRISPR weighs in” from TED on Aug. 22, 2017. The column is an excerpt from Jennifer Doudna and Samuel Sternberg’s book, A Crack in Creation: Gene Editing and the Unthinkable Power to Control Evolution. 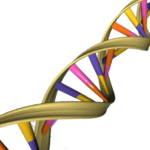 Read “Gene editing: Gateway to Promised Land, or key to Pandora’s box?” from Religion News Service on Aug. 3, 2017. Read “Embryo Gene-Editing Experiment Reignites Ethical Debate” from Scientific American on Aug. 2, 2017. Read “Gene Editing: Promise & Peril,” a guest post by Gilbert Meilaender in Commonweal, from March 13, 2017. Read “God and the genome: A geneticist seeks allies among the faithful” from STAT News on Oct. 13, 2016. Watch “Ethics of Gene Editing” from Religion & Ethics NewsWeekly, which originally aired July 3, 2015. The Center’s Genetics and Society research initiative explores the relationship between religion and genetics and how DNA research affects participants. Ruha Benjamin is an associate professor in the department of African-American studies at Princeton University. She’s spoken and written about the importance of equity and disability justice in the gene editing debate. Benjamin is the author of People’s Science: Bodies and Rights on the Stem Cell Frontier. Dr. Jeffrey Botkin is professor of pediatrics and adjunct professor of human genetics at the University of Utah School of Medicine in Salt Lake City. He previously served as chair of the Committee on Bioethics for the American Academy of Pediatrics. Sarah-Vaughan Brakman is associate professor of philosophy at Villanova University in Villanova, Pa., where she served as founding director of the Ethics Program from 1999-2004. She co-edited The Ethics of Embryo Adoption and the Catholic Tradition: Moral Arguments, Economic Reality and Social Analysis. Lisa Sowle Cahill is a professor of theology at Boston College who has written about genetics from a Christian perspective. Her books include Theological Bioethics: Participation, Justice and Change and Bioethics and the Common Good. R. Alta Charo teaches law and bioethics at the University of Wisconsin law school. From 2015 to 2017, she was a member of the Human Genome Editing Initiative, a joint project of the National Academy of Medicine and National Academy of Sciences. She previously served on President Bill Clinton’s National Bioethics Advisory Commission. George Church is a professor of genetics at Harvard Medical School and professor of health sciences and technology at Harvard and the Massachusetts Institute of Technology. He co-launched the Human Genome Project in 1984. His current research includes efforts to extend animal lifespans. Ellen Wright Clayton is a professor of pediatrics, law and health policy at Vanderbilt University in Nashville, Tenn. She also holds an appointment in the university’s Center for Biomedical Ethics and Society. She has advised numerous federal and international bodies on topics including children’s health and the ethics of research involving human subjects. Ronald Cole-Turner is the H. Parker Sharp Professor of Theology and Ethics at Pittsburgh Theological Seminary, author of Transhumanism and Transcendence: Christian Hope in an Age of Technological Advancement and editor of Design and Destiny: Jewish and Christian Perspectives on Human Germline Modification. David M. Craig is a professor of religious studies at Indiana University – Purdue University, Indianapolis. He also serves on the faculty of the school’s Center for Bioethics. Craig specializes in health care ethics, with an emphasis on economic access. Marcy Darnovsky is executive director of the Center for Genetics and Society. She speaks and writes about why scientific advancements such as gene editing are a social justice concern. Contact: darnovsky@geneticsandsociety.org, 510-665-7760 ext. 305. John Hyde Evans is a sociologist at the University of California, San Diego. He wrote Playing God? : Human Genetic Engineering and the Rationalization of Public Bioethical Debate and The History and Future of Bioethics: A Sociological View. Leonard M. Fleck is a professor in the Center for Ethics and Humanities in the Life Sciences and the department of philosophy at Michigan State University. He studies how decisions are made about controversial medical advancements, including genetic technologies. Hille Haker is the chair of Catholic moral theology at Loyola University Chicago, where she studies human rights, bioethics and feminist ethics. Haker serves as editor of the Values in Bioethics book series and is a member of the European Group on Ethics in Sciences and New Technologies of the European Commission. Richard O. Hynes is a researcher and professor at the Massachusetts Institute of Technology. He served as co-chair of the Human Genome Editing Initiative. Jeffrey Kahn directs the Johns Hopkins Berman Institute of Bioethics and teaches courses on bioethics and public policy at Johns Hopkins University. He has served on numerous state and federal advisory panels and speaks nationally and internationally on a range of bioethics topics. He co-edited a book examining justice and research ethics titled Beyond Consent: Seeking Justice in Research. John D. Loike is a research scientist in the department of biomedical engineering at Columbia University, focusing on bioethics, stem cells, cloning and the interplay between science and religion. In 2018, he co-authored a study on how to apply Jewish teachings to medical advancements like gene editing. B. Andrew Lustig is the Holmes Rolston III Professor of Religion and Science at Davidson College in Davidson, N.C. His specialties include bioethics and religion and science. He was staff ethicist for then-Gov. Mario Cuomo’s New York State Task Force on Life and the Law. Gilbert Meilaender is a senior research professor at Valparaiso University in Valparaiso, Ind., and a fellow at the Notre Dame Center for Ethics and Culture. He was a member of the President’s Council on Bioethics from 2002 to 2009. The Rev. David Nichols is the pastor of Mount Tabor Lutheran Church in Salt Lake City. He helped launch the Faith, Ethics and Science Roundtable, which brings together religious leaders and scholars for monthly discussions. Kelly E. Ormond is co-director of Stanford University’s master’s program in human genetics and genetic counseling and a faculty member with the Stanford Center for Biomedical Ethics. She previously served as president of the National Society of Genetic Counselors. Erik Parens is a senior research scholar with the Hastings Center, a nonpartisan, nonprofit bioethics research institute. He leads investigations into disability rights and what human flourishing means in the era of gene editing. Parens is the author of Shaping Our Selves: On Technology, Flourishing and a Habit of Thinking. Contact: parense@thehastingscenter.org, 845-424-4040 ext. 224. Ted Peters is a research professor emeritus in systematic theology and ethics at Pacific Lutheran Theological Seminary, the Center for Theology and the Natural Sciences and the Graduate Theological Union, all in Berkeley, Calif. He is the author of God in Cosmic History and Playing God? : Genetic Determinism and Human Freedom and is co-editor of the journal Theology and Science. Ting Wu is a genetics professor at Harvard Medical School. She’s hosted discussions on gene editing with members of the clergy and other community leaders in an effort to increase public awareness. Laurie Zoloth is a professor of religion and ethics at the University of Chicago Divinity School, where she previously served as dean. Before coming to the University of Chicago, she was a professor of religious studies at Northwestern University and professor of bioethics and medical humanities at the university’s Feinberg School of Medicine. Zoloth is a past president of the American Society for Bioethics and Humanities. She is the author of Health Care and the Ethics of Encounter: A Jewish Discussion of Social Justice and co-editor of Notes From a Narrow Ridge: Religion and Bioethics and The Human Embryonic Stem Cell Debate. David Archard is chair of the Nuffield Council on Bioethics, a London-based organization that explores the ethics of medical advancements. He is also an emeritus professor of philosophy at Queen’s University Belfast. In 2018, Archard co-authored a Nuffield Council report endorsing the use of germline gene editing in some circumstances. Francoise Baylis is a philosophy and bioethics professor at Dalhousie University in Halifax, Nova Scotia, Canada. She studies women’s reproductive health, new genetic technologies and health care access. Annelien Bredenoord is a professor of the ethics of biomedical innovation at the University Medical Center Utrecht in the Netherlands. One of her areas of interest is how to ethically move medical advancements from the research to clinical care stage. Fola Esan is director of the Institute of Genetic Chemistry and Laboratory Medicine in Ibadan, Nigeria. He previously served as director of the National Institute for Medical Research in Lagos, Nigeria. Tetsuya Ishii is a professor in the Office of Health and Safety at Hokkaido University in Hokkaido, Japan. He participated in the 2015 international summit on human gene editing. Jonathan Kimmelman directs the biomedical ethics unit at McGill University in Montreal, Quebec. His research focuses on the ethical and social implications of human testing for genetic technologies. Ephrat Levy-Lahad teaches medical genetics at the Hebrew University of Jerusalem and directs the Medical Genetics Institute at Shaare Zedek Medical Center. She took part in the International Summit on Human Gene Editing in December 2015. K. Vijay Raghavan is secretary to the Government of India Ministry of Science and Technology’s Department of Biotechnology and a professor of developmental genetics at the National Centre for Biological Sciences in Bangalore, India. He took part in the first international summit on human gene editing in December 2015. Contact: vijay@ncbs.res.in, 91 80 2366 6040.